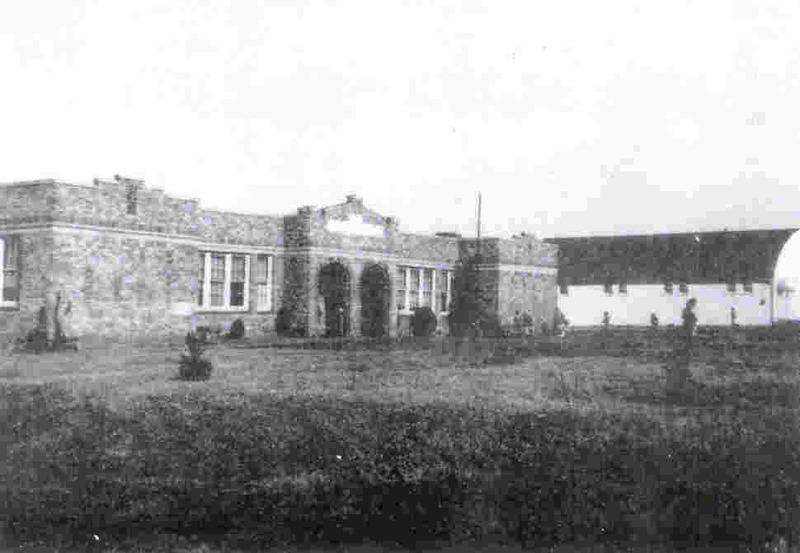 I attended Saltillo School from 1938 to 1945. I began there in the second grade. The brick school was on the north side of town and faced south. It was constructed in 1930. * The main structure made of brick accommodated grades 1 through 12. A gymnasium, constructed of wood, stood alone to the east of the main building. In the rear of the gym building was an area where shop classes were held. The principal of the school lived adjacent to the school grounds on the west side of the school. Aside from some outdoor toilets, that was Saltillo School during my time. on her desk. Everyone sat up in their seats and took notice. crept over her from having lost her temper, for she said, "You can get a drink if you want." Miss Mitchell, who was very prim and proper old maid, taught English. In addition to trying to teach me something about grammar, she also was my homeroom teacher. One of the jobs of a homeroom teacher back in those days was to periodically visit your parents and talk about you and school. I lived with my Uncle Jack and Aunt Minnie, and I use to dread seeing Miss Mitchell come wheeling into the driveway in her 1937 Chevy. You were not present at the conversations, and were outside wondering what all she was telling your folks. Most of the time the fear and apprehension you had amounted to nothing. But sometimes, after the teacher came calling you were apprised of various bits of what transpired, and in no uncertain terms. I still remember the classrooms of Saltillo school. They had those desks where you slipped your books and stuff underneath the top. The tops were used for writing, and in the right-hand corner was a hole for an ink bottle. Around the top of the blackboard was the alphabet of letters in the form you were suppose to write them; A a B b C c and so on. In the corner of the room was a wood stove sitting on a sheet of tin which had been tacked to the wooden floor. During the day at recess each pupil had to carry in a stick of wood from the woodpile for the stove. Near the woodpile was a big chunk of tar that was probably left over from roofing the school building in the past. So in addition to getting a stick of firewood from the woodpile, every pupil would break off a little piece of tar to chew. I guess you could say it was our pay for carrying in the wood. But the serious part of the classrooms was learning the multiplication table, diagramming sentences, spelling, arithmetic, and reading, which everyone had to master. The real fun part of school was recess. We had a 30-minute recess about mid-morning and a 30-minute recess in mid-afternoon. There was also a recess as part of the lunch hour, and there was some time to play in the morning before the bell rang for you to line up to enter the building. Recess was where real socializing took place. There were fights, foot races, bullying, name calling, and shoving. Usually two classes took recess at the same time, and the two teachers would stand together talking and looking over the place. Mostly they were given to breaking up fights and ministering to someone who got hit with a swing. At lunch recess a favorite activity after eating was for as many kids as possible to get on the merry-go-round, and get it going as fast as it could go and see who would throw up first. Sounds gross doesn't it? Games were a big part of recess. The girls had their games of Jacks, Drop the Handkerchief, Ring Around the Rosy, and Jump Rope. For us boys there was spinning and plugging tops, marbles, and mumble peg. Sometimes during the year there would be, for example, a period of time when everyone brought a top to school and engaged in spinning and plugging tops. Tops made of bois d arc wood were the prized ones, for they were tough and hard to split. Playing with tops would run its course then something else would crop up, like shooting marbles. And, so it went. My favorite game was Strongman, which in some parts of the country is called "Buck Buck." In this game there would be six or eight pupils chosen as a team of two teams. The ritual of choosing the team members was almost as much fun as the contest itself. If you were a big kid or a fat kid you were one of the first ones to be chosen. If you were both big and fat, you were the first one chosen. One team would go down, that is, one kid would stand upright with his arms locked around a pole, and behind him would be his team mates with their heads between the legs of the person in front and their arms locked around them. The team which was up would one at a time run from a line and leap frog onto the backs of the team who was down. The goal was for everyone to land on top of whom they thought was the weakest person down. If the team was unable to buckle the team down, then they had to be the team down. Sometimes there was no game to what we did on the playground during recess. We would just aimlessly wander about and a couple of boys would wrestle another to the ground. Once he was pinned to the ground, one would bend his leg until he gave up, or shouted, "That's enough!" Almost every boy knew how to use his fists. Some proficiency was expected. And if a bully made a habit of tormenting you and your father found out about it, you were told to tie into him the very next time he bothered you, and keep at it until you bloodied his nose or he retreated like a dog with his tail between his legs. Everyone tested each other to see what they were made of, mamma's boys, sissies, and all. It reminds one of a yard full of young roosters where they are pecking, fighting, and chasing each other. One year a new family came to town. They had everything they owned on a Model T Ford truck. They were dirt poor, as this was during the Great Depression. They set up housekeeping in an abandoned house across the road from where I lived. The school was across the road on the other side of the house. If I recall, they only stayed in town one year. I think they were an itinerant family who followed the harvests. There were five school-age boys in the family, and the oldest was a redhead. When I was a kid, if you were red headed you had some kind of special standing and was given a wide berth. You were suppose to be mean, high tempered, and endowed with the fighting characteristics of a bobcat. The five boys of this new family were quite a group to be tested at one time to see what they were made of. And the oldest being a flaming redhead, just added to the excitement and anticipation. Someone once said there is nothing more exciting than men hunting down men . . . as in war. Maybe there is something primitive to this. Anyway, everyone was at the school boundary before school took up to initiate the five boys as they made their debut. A lot fighting and shoving ensued, with the oldest boy, the redhead, defending his brothers as best he could. The confrontation ended almost as soon as it started. And as these things went, later in the day you may see two of the combatants together, and by the way they were acting you would think they had been lifelong bosom buddies. Nothing ever got out of hand, such as the use of a knife, biting, or choking. It was engrained in every boy that if he had to fight, he had to fight fair. You never sucker punched another kid, pulled his hair, or gouged his eyes. And if you did, everyone would suddenly turn on you. In schools of the past there was a tendency to let playground disputes work themselves out. Years later, long after I had left Saltillo, I was teaching in a large city high school, grades 7 through 12. One day after school the shop teacher, a Mister MacMillan, was standing by the window watching two boys fighting. The principal happened to come up behind Mac and noticed what attracted his attention. He said, "Mac aren't you going out and break up that fight." "Naw," Mac calmly replied. "I figure it is best they are fighting here under my supervision than off the school grounds where they might get their hands on a knife or bottle." I thought Mac was right, but as a new teacher I doubt if I would have had the guts to say that to the principal. During my Saltillo School days, we did a lot of things without adult supervision. If a group wanted to play softball, for example, but didn't have enough players for two teams, they played one batter work up. If a dispute came up where shoving, or even fighting, ensued, it worked itself without an adult to mediate or take charge. Such conflicts never lasted long. And before you knew it, everyone was back playing softball. Again, I think the notion of fairness prevailed. It wasn't fairness in the sense you got to do what you wanted to do, but fairness in the sense of the rules or what you had earned. Aside from this, no one got any special rights. It was a really big deal as a kid in a country school to be able to go home with one of his or her best friends and stay all night. You got to ride his bus and see how his family lived. I was always interested in what they had to eat. And just prior to one of these overnight stays my Aunt Minnie would always remind me that after supper was finished I was to go up to the lady of the house and tell her what a fine meal she served and how much I enjoyed it. You were expected to exhibit good manners. No matter where you were, at school, in town, or in someone else's house, if you didn't behave, some adult, who may not even know whose kid you were, would set you straight. There were some special things that happened at school. At Christmas your classroom had a tree which everyone helped decorate. Names were drawn for presents, and everyone got something. School plays involved almost everybody. Each elementary grade at sometime or another put on a play. All the parents and relatives attended. I remember the curtain on the stage of the little auditorium at Saltillo School. It had advertisements on it of some of the businesses in the area. The curtain wasn't fancy, just white script on black cloth. Years later I worked with a man in Indiana, who was from Kentucky and whose wife sold these very kinds of curtains. When it was time for school to end for the year everyone was just as happy as they were for it to begin. For one thing, you got to go barefooted all day long. Swimming was another activity which everyone anticipated. Just as there were things exclusive to school, there were things unique to summer. It was a cycle of seasons and things to do. After summer was well underway, there would be fleeting moments when you would think about the start of school again. * School was first held in Saltillo in 1889 in the lower story of a two story building constructed by the Masons. The building was located just north of the railroad tracks on what is now Farm Road 900. It was west of the old cotton gin. The first school building as such was built in 1900 across the road (HC 3534) of the old Sparks' place. This building was replaced in 1930 with a brick building. In 1975 the present building replaced the one built in 1930.